This week I’m hosting Maggie K. Black with Silent Hunter, Nancy Mehl with Deadly Echoes (US only), and Melody Carlson with Love Gently Falling (US only). If you want to enter the drawings for the books, please leave a comment on your post with your email address. I will not enter you without an email address (my way to contact you if you win). If you don’t want to leave an email address, another way you can enter is to email me at margaretdaley@gmail.com. The drawings end Sunday (Feb. 15th) evening. 1. Luke, tell me the most interesting thing about you. Talk about starting off with a hard question! Ok, I guess I’d say that I’m really blessed that my passion for both sports and kids is huge part of my everyday job. Right now, I’m the sports reporter for Torchlight News in Toronto. (I actually worked my way up from a job in the warehouse.) And I absolutely love it! Because it’s not just covering the big name professional athletes. I get to cover all the different kids’ groups, school groups, community groups and charity events—and I absolutely love that! This time of year I spend a lot of time on the sidelines cheering on kids hockey games. It’s the best! I love sports—obviously. I’m on a few different community teams with friends from Torchlight and church. But I have a special passion for archery. I have a beautiful, wooden homemade recurve bow I made myself. In the summer, Toronto has a couple of parks where you can shoot outdoors. But my favorite range is in the basement of a church in downtown Toronto. Sometimes, after work, I go there just to shoot arrows and relax. (Laughs). Would it sound weird if I said, “Going home at the end of the day”? See, I just live in this tiny little hole-in-the-wall apartment downtown. Because it’s all I really need. I basically just go home to sleep. Wow, these questions are not getting any easier, are they? Okay, if I’m honest I worry about repeating some of the mistakes I made in the past and not living up to the faith that people have put in me. Years ago, when I was in a really bad place, and basically looking at ending up in jail or worse, somebody awesome gave me a shot at turning my life around. I’m afraid of not living up to that second chance I was given. I want to make a difference, honestly. I want to encourage people, especially kids. I want those kids playing little league hockey out on the ice who don’t have parents or supportive adults in the stands, to know that I genuinely care about them, believe in them and want them to make the most of their lives. I want everyone I write about to know that they’re special and valued and can do something awesome with their lives. Like I said, someone once gave me a second chance when I didn’t deserve one. I would love to do that for kids like the foolish boy I used to be. Making a difference, being physically fit and the team of awesome people I work with at Torchlight News all mean a lot to me. And my faith matters a lot to me too. I go to a great community church, and I love stories of faith in action. But I would say the most important thing for me is putting what you believe into action—your faith, your beliefs, your commitment to your community. Getting out of your seat, getting out on the field, and actually making a difference. 7. Do you read books? If so, what is your favorite type of book? I like biographies and autobiographies. I find them really inspiring, especially people who’ve overcome rough backgrounds. I’m reading a book about William Wilberforce right now—he’s a politician who turned his life around because of his faith and worked to abolish slavery in England. I also really love the essays of C.S. Lewis. He wrote a lot of about making your faith practical and real. Hmm. Well, I’m at a stage right now where I’ve worked really hard to change the person I was and I’m happy about that. I think I put the mistakes I made in the past behind me. If I could erase my past, I would, in a heartbeat. But since I can’t change my past all I can really do is keep moving forward as the man I am now. Being a sports journalist is interesting. I am intrigued by Luke Wolf and SILENT HUNTER! Whoo! This Luke sounds like a dreamboat and a half! 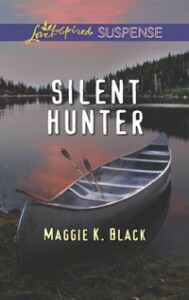 I’m loving Maggie’s writing after just 8 little questions answered so I am definitely looking forward to reading Silent Hunter!